Ticket King Milwaukee Wisconsin: Ticket King Milwaukee Can't Wait for the Rocking Hits of Chuck Berry! Ticket King Milwaukee Can't Wait for the Rocking Hits of Chuck Berry! 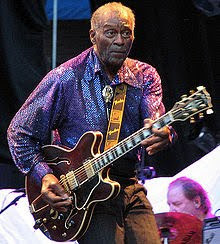 Live in person, the Icon and so called 'pioneer' of Rock N' Roll music, Chuck Berry is coming to Milwaukee this week! The legend will be performing at the intimate Northern Lights Theater inside the Potowatomi Casino on Thursday February 18th at 8pm. Chuck Berry tickets are a hot commodity for Milwaukee fans this season looking to get their fix of "Johnny B Goode" and "Rock and Roll Music"! I wasn't sure who he was until I heard those songs he is known for and now I think it's going to be a great concert! There's a few great seats left! Should be a rocking time!